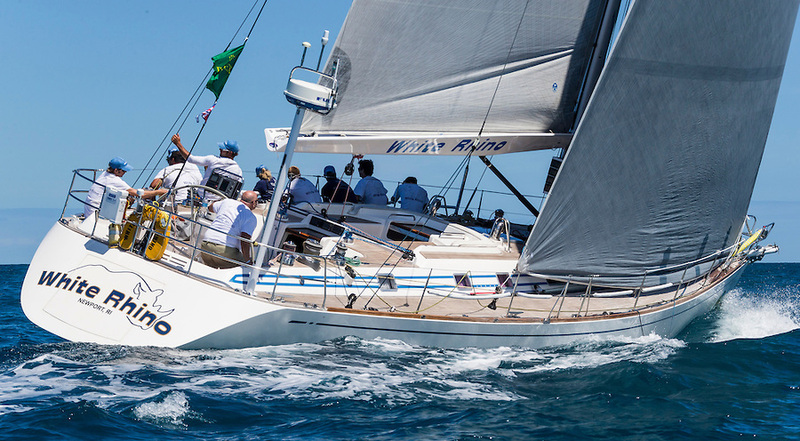 Nautor's newest, the Swan 40 designed by German Frers, may be an interesting comparison boat for those of you compiling knot-per-dollar ratios. To most of us, Swans have come to represent the best of the breed. "Swan quality" is an industry accepted specification. We remember vividly the sleek, wedge-decked Swans of the early 1970s, and we remember the high-freeboard Swans of the mid-1980s. As displacements generally went down, Swan's freeboards went up in order to maintain the low, wedge-deck geometry. I think the new 40 shows that Nautor has entered a new era. 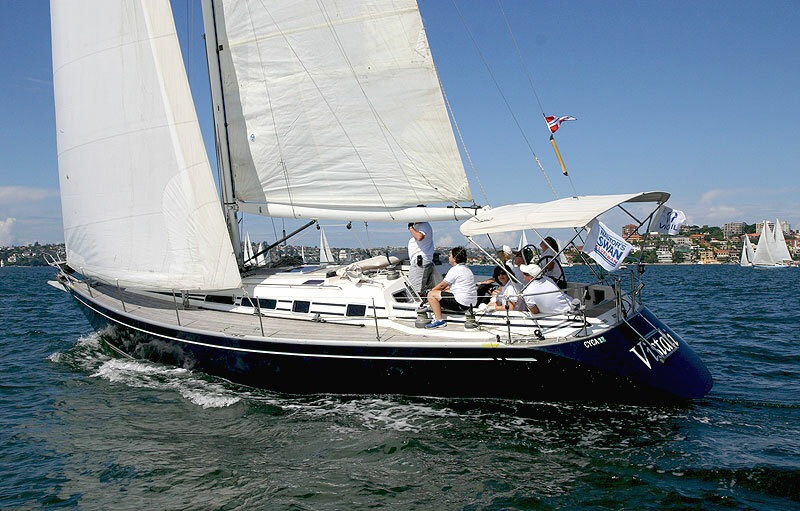 A Swan 40 glides along on an upwind tack. 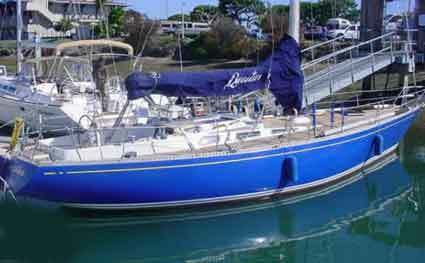 The 40 has a moderate displacement hull — D/L ratio of 187 — with considerable fore-and-aft hull rocker. The canoe body fairs aft into a small IOR-type skeglet before the counter kicks up. Note that the forefoot knuckle of this design is just below the DWL, while it is just above the DWL in the Tripp-designed C&C 45. The midsection shows a moderate BWL and an arc-like shape that almost goes tangent at centerline but stops short with about three degrees of deadrise. Terms: While "tangent at centerline" is not exactly a nautical term, it is the way I describe a sectional shape that is virtually flat at the centerline or, in correct terminology, has no deadrise. This does not mean the boat is flat-bottomed but rather that the shape is an unbroken line with no crease at centerline. Deadrise is the angle off horizontal that the bottom of the boat makes at centerline. 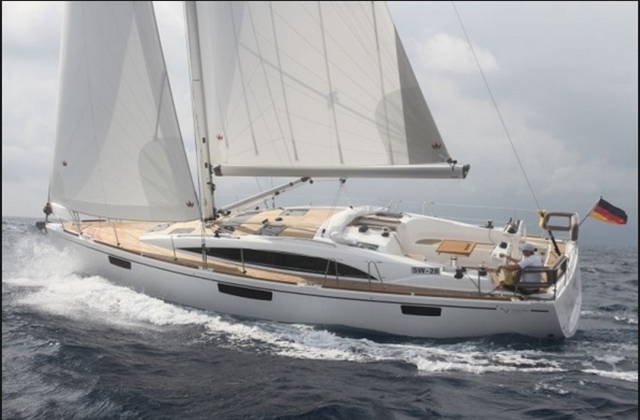 Design specifics aside, perhaps nobody draws as beautiful a hull shape as Frers does. He has the knack to maintain a classic set of proportions regardless of the basic parameters. Keel sweep angles are rapidly diminishing. 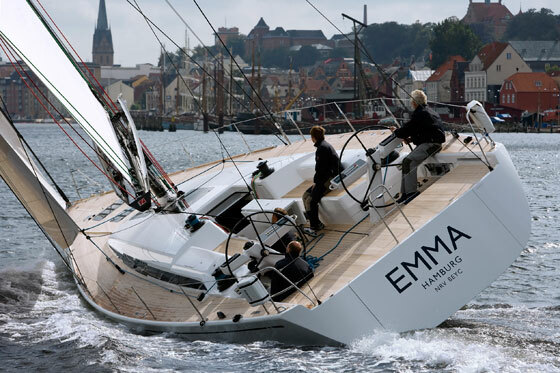 This Frers design shows the leading edge swept 11 degrees. There is some type of bulb on this keel, with the bulb shown protruding from the trailing edge. I don't think it's good to have the bulb protrude from the leading edge, especially if you sail in kelp areas. 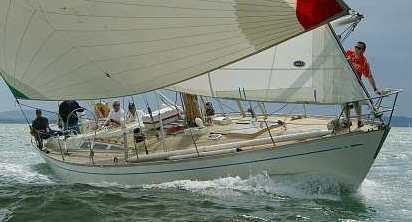 The 40 has a rudder with a curved leading edge and a curved trailing edge. Beam distribution on this design appears very normal, with max beam being precisely at station 6. The deck shows two opening ports in the trunk and six opening hatches. Side decks are wide and the chainplates are on the 12-degree line. There is a flush anchor-windlass locker forward. The cockpit coaming is very narrow, and you could not comfortably sit on it to steer. There is an extended bridgedeck to push the companionway forward, and there is a small cockpit to help shorten the run of the companionway ladder. As you study this deck, you will find it is quite subtle in its shape changes. Note how the cockpit coamings are not a fair extension of the trunk sides but, in fact, are nipped in. 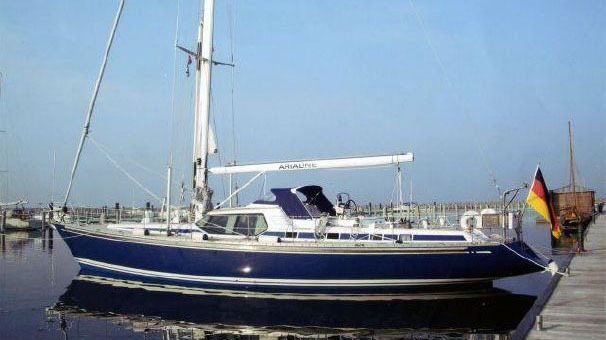 Note how far the halyard winches and stoppers are away from the wheel. This is not the best arrangement for short-handed cruising. All winches are the newest Lewmar Ocean series. The hatches are by Goiot. I find it interesting that, in pursuit of classic good looks, Nautor has chosen to use a fold-down boarding-swim platform rather than an exposed transom cutout. This is an expensive detail but results in a clean transom. This 40-footer has an aft cabin tucked under the bridgedeck and cockpit. It is tight and probably dark despite the small hatch in the bridgedeck, and I think it would be tough to ventilate. The aft berth is a single-double, and there is a small head aft that I am sure is an exquisite one-piece molding. The galley fares better and shares the top of the engine box for the sink location. Of all the interior components, I think the navigational center comes off the best. There is a long bench seat with a big chart table and an angled housing for your instruments. The layout here shows a pilot-berth to port and lockers to starboard above the settee. This area seems tight, but you really can't spread it out any more and still use the drop-leaf table without it becoming clumsily big. The forward stateroom has its own head. You have to enter both staterooms to gain access to the heads. This seems a reasonable compromise for a 40-footer. There is a small seat in the forward stateroom so you can sit and remove your shoes. Headroom in the forward stateroom scales off to be about 5 feet, 10 inches. That's the price of looking sleek, and certainly a reasonable price to pay, in my opinion. Looking at the rig, I am again reminded of the battle Nautor is fighting here. It's obvious that they are after top performance, with three spreaders, some prebend, a babystay and runners. The SA/D ratio is 19.26. 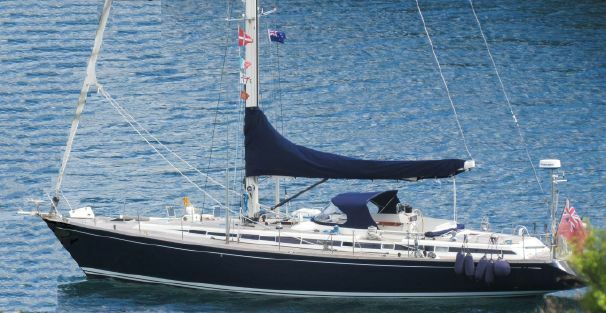 This is low for a competitive IMS boat but certainly muscular for a family cruising boat. Nautor has always used stout mast sections and, once again, here the use of the babystay indicates that it is needed in order to bend the stick. Nautor's transition into the new IMS era is attracting attention. 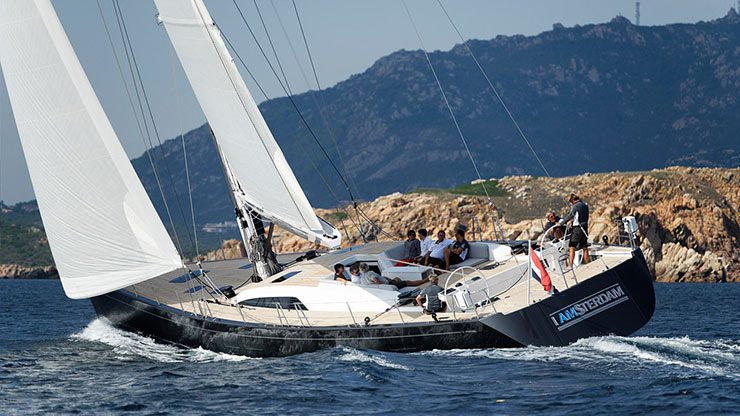 Sail Area 435.9 sq. ft.